With three years of major iPhone software versions under its belt, Apple’s strategy for releasing updates has fallen into a recognizable pattern. So far, every release has been anchored by a tentpole feature that many will argue should have been there from the beginning. In iPhone OS 2.0, that was support for third-party apps; in iPhone OS 3.0, it was cut, copy, and paste; now, in the re-branded iOS 4, it’s multitasking. Make no mistake, multitasking is the lynchpin of iOS 4; for better or worse, the rest is just window dressing—though welcome window dressing, to be sure. He tasks me, and I shall have him! Multitasking represents the biggest fundamental change to iOS at least since last year’s introduction of cut, copy, and paste—possibly in the history of Apple’s mobile devices. As with those text manipulation features, we’ve grown so accustomed to working without multitasking that it’s likely going to take an adjustment for most users to override that instinctive muscle memory that requires jumping back to the Home screen whenever switching applications. Fast app switching, summoned by double-clicking the Home button, is the part of multitasking most users will see. As pedants will no doubt note, the iPhone’s multitasking is actually multitasking with an asterisk. In the company’s preview of the new operating system back in April, it laid out seven specific types of tasks that could run in the background. The combination of these tasks presents a convincing simulacrum of the kind of multitasking you’ll find on a desktop computer, but there are holes in the functionality. For example, Instapaper developer Marco Arment pointed to one of the major gaps not addressed by iOS 4—the ability for applications to grab new data from the network while they’re in the background. So if you’re hoping that iOS 4 means that your RSS reader or Twitter client will be able to download new content while in the background and present it to you when you switch to the app, you’re going to be disappointed. (Arment’s post also presents a potential solution to this problem which I would be surprised if Apple didn’t implement at some point). For many users, though, the iOS 4’s implementation of multitasking will be good enough. And because Apple’s built the background capabilities into the OS, rather than leaving it up to individual developers, the company’s take on multitasking lets users do multiple things at the same time without chewing through their phones’ battery life. In my admittedly informal tests, multitasking in iOS 4 didn’t seem to drain my iPhone 3GS’s battery any faster than the previous version of the operating system, and I certainly wasn’t holding back on the multitasking. The part of multitasking that most users will actually think of as multitasking was actually the seventh and final item on Apple’s list of multitasking frameworks: fast app switching. This is a neat bit of sleight-of-hand: what actually happens is that developer’s can now implement a way for an app to save its state—essentially to take a snapshot of exactly what you were doing when you left the app. That way, when you switch to another app, and then back to the first app, you’re instantly put back right where you left off, with no need for the app to reload any data. When it works, it works great. At this point, however, the vast majority of apps in the App Store have not yet been updated to take advantage of fast app switching—it’s mainly limited to Apple’s own applications (and not even all of those—the recently released Apple Store app doesn’t appear to support multitasking). Switching to an app that doesn’t support fast app switching—even one like Twitter, which has long had its own state-saving functionality—feels a lot less like multitasking, since you end up waiting for it to reload your data. As should be no surprise, Apple has tried to devise a multitasking system that feels like it fits within the iPhone’s existing user paradigms. Unlike on Mac OS X, where the list of running apps appears as an overlay splashed across the screen, the iPhone method borrows more from the Mac OS’s interface for adding a Dashboard widget. Double-click the Home button and the entire screen slides up, presenting a “shelf” of four app icons. Apple arranges these icons by those that have most recently been in the foreground; swipe from right to left, and the list continues with the next most recent applications, and so on, ad infinitum. Tap on any of them and that app is brought to the foreground with a nifty “card-shuffling” animation. That’s great when you want to switch between a couple apps or, best of all, when you click a link in one application that, say, launches Safari. It’s less great when you want to switch to anything beyond the applications you’ve most recently been using. Because the iOS doesn’t automatically excise inactive applications, the shelf contains every application you’ve run, but, unlike your Home screens, the apps aren't in fixed locations. After you’ve spent a decent amount of time swiping through a list of “running” applications, looking for one particular app, you start to wonder if it wouldn’t have been faster to jump back to the Home screen and tap on the app there, since you know where it is. Fortunately, even if you do that, you should still be able to reap the benefits of fast app switching—your state should still be saved if you were running the app recently. As I said earlier, my biggest struggle is remembering to double-click to bring up the shelf instead of going back to the Home screen. Three years of iPhone usage has trained me to instinctively click that Home button and it’s going to be an uphill climb changing that habit. But that’s merely a fault of my imperfect brain, not necessarily of Apple’s design, and your mileage may vary. To remove an app from the shelf, tap and hold an icon and then tap the red minus that appears in the top left corner. For what it’s worth, you can remove apps from the shelf: tap and hold any of the icons there and they’ll start to dance, as they do on the Home screen when you want to rearrange them. You’ll also see a red badge with a minus sign in it on the top left corner of each of the icons—tap that, and the app will be banished from the shelf, until the next time you launch it. It’s one of those features that’s nice to have, but I have to imagine that most users won’t spend too much time managing their shelves of apps. Of course, fast app switching isn’t the only facet of multitasking in iOS 4, though it is certainly the most visible. You’ve long been able to use Apple’s built-in iPod application to play audio in the background—iOS 4 now lets third-party applications, such as Pandora, do the same. 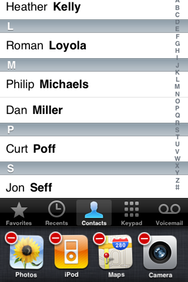 Voice over IP applications such as Skype and Fring will let you carry on conversations while running in the background, and location-based apps such as Loopt and GPS turn-by-turn apps like Navigon Mobile Navigator will be able to update your location even when they’re not running (for more on this, see “Private security” below). Alarm clocks and other reminder applications will be able to pop-up messages without having to rely on complicated push notifications. And some apps that have time-consuming tasks—such as photo uploading—will be able to finish those jobs in the background. Unfortunately, since apps have to be updated to take advantage of these new multitasking features, I was unable to test most of iOS’s new capabilities as of this writing. But rest assured as more multitasking-aware apps arrive, we’ll be giving them a thorough look. The proliferation of apps has not slowed a bit since their introduction two years ago, and while Apple tried to give us a better way to organize them when it introduced iTunes 9, that desktop-based approach was more of a band-aid than a cure. The addition of folders in iOS is another attempt at dealing with the deluge of mobile applications, but it has its own kinks. Folders allow you to group up to 12 apps in one container and shows a thumbnail image of their icons. To make a folder, just tap and hold on an app until the apps begin their traditional dancing. 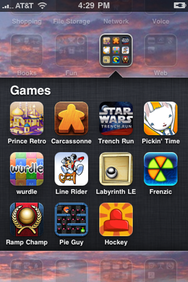 Drag one app atop another and bam—instant folder. (For those for whom “folder” conjures a mental image of the Mac OS’s longstanding metaphor for organizing documents, it’s actually a bit of a misnomer on the iPhone—they’re more like corrals of apps.) By default, iOS names the folder after the category of apps (Entertainment, Sports, Games, and so on), though you’re also given the option to change that name to whatever you like. The folder icon shows miniature thumbnail versions of the icons of every app inside—a neat touch, but on the iPhone 3GS’s screen, it’s tough to tell what any of the apps are, so a good filing system is going to be key. Tapping any folder causes the screen to slide apart, showing you a dark grey band with the name of the folder and the apps inside it. You can have a maximum of 12 apps in a folder—try to drag in any more than that and the folder won’t accept it. Even though folders hold a dozen apps, only the first nine icons get displayed in the thumbnail view. You also can’t drag folders into folders—one level of hierarchy is all you get. If one of the apps in the folder gets a notification with a badge (like Mail), then the badge appears on the whole folder and you’ll have to tap that folder to see which app it’s referring to. Previously, the limit of 11 home screens meant you could only see 180 applications on your phone (you could load more, but to launch them you’d have to search for them in Spotlight); now that number is well over 2000. You can also manage folders in iTunes on your Mac or PC, if that’s more to your liking. As nice as folders are, they strike me as more of a stopgap for a system that has outgrown its roots—Apple clearly never expected third-party apps to be the huge success that they are, so for my part, I hope that folders are indeed an interim solution while Apple comes up with an entirely new way to manage applications. My colleague Dan Frakes takes an in-depth look at the new feature. The top level of the Mail app now has an All Inboxes option as well as quick access to all of your inboxes. 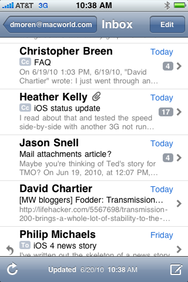 Mail got a significant chunk of attention in iOS 4, with the addition of three major new features. The first is the much anticipated unified inbox, which has been a staple in Mail’s Mac counterpart for years, as well as a regular bullet point on our wishlists of missing iPhone features. Now, at the top level of Mail, you’ll see a new screen that lists inboxes for all your accounts, as well as an All Inboxes option that lets you view all of your accounts’ inboxes mushed together. At the risk of sounding heretical, however, the unified inbox doesn’t do much for me, mainly because my e-mail is divided up into personal and work e-mail, and never the twain should meet. That said, listing all the inboxes at the top level significantly speeds up jumping between inboxes on multiple accounts, so in this case, I’d argue Apple’s solution was even better than just a unified inbox. Another feature from OS X’s Mail that makes its way to the mobile OS is conversation threading. An Organize By Thread slider in Settings -> Mail, Contacts, Calendars switches this on for all your accounts (it’s an all or nothing proposition); once you’ve done that, you’ll see a small gray box with a number in it next to your threads, telling you how many messages are in that thread. The information displayed at the top level is that of the first unread message in the thread—or, if all the messages are read, the most recent message. Tapping the thread will display a list of all the messages in that thread along with a title bar with the the subject line of the thread and the date it was most recently updated. Threads show up as small number icons with the number of messages in the thread. As handy as threading is, it takes a little time to get to used to, since many of your unread messages may end up a level farther down than you expect. 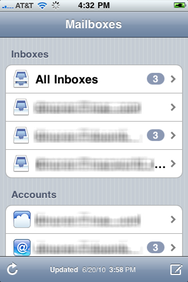 But it does offer a more compact viewing experience and helps reduce inbox clutter, which is a plus. The third major new feature in Mail is borrowed not from the Mac, but from the iPad: the ability to open attachments in third-party applications (once applications are updated to take advantage of the feature). It’s important to remember, however, that any changes made in version that you open from Mail are not reflected in the original attachment. You can now move or delete multiple messages in a search result if, for example, you want to move all messages from John Smith into a separate folder. The interface on that, however, is a little unwieldy—you have to tap the message list to hide the keyboard and reveal the Edit button in the bottom right. For those who use MobileMe’s e-mail aliases, you’ll be glad to know that there’s finally support for them in Mail as well. And, if you wish to sync notes from an IMAP account other than MobileMe, you can do that, too.